1. What is the difference between TSKgel Super-ODS and ODS-140HTP columns? TSKgel Super-ODS reversed phase columns, when introduced in 1995, were the first commercially available columns packed with sub-3 micron particles. Often referred to as 2 micron packed columns, the mean particle size of the silica is 2.3 micron. The same silica lots used to prepare TSKgel Super-ODS columns are used in the manufacture of TSKgel ODS-140HTP columns. There are two important differences between the two column types. First, although the same polymeric C18 bonding chemistry is used to produce TSKgel Super-ODS and ODS-140HTP columns, the endcapping reaction on TSKgel ODS-140HTP columns is more exhaustive than on TSKgel Super-ODS columns (please see the following paragraph for additional details). In addition, TSKgel Super-ODS (as well as Super-Octyl and Super-Phenyl columns) have restrictions for flow rate as well as pressure. For instance, the 4.6 mm ID TSKgel Super-ODS columns cannot be operated above 30 MPa, nor above 4 mL/min. In contrast, the upper pressure limit for 2.1 mm ID TSKgel ODS-140HTP columns is twice as high at 60 MPa, and there is no upper limit for the flow rate, making TSKgel ODS-140HTP columns your TSKgel columns of choice for use at ultra-high pressures and flow rates. improved chromatography of chelating compounds. 2. What are the naming conventions for Tosoh Bioscience RPC columns? The TSKgel designation is the company’s trademark for all liquid chromatography columns. The letters “ODS” stand for octadecylsilane or C18 bonded to a silica support material. The number 80 or 120 in the name denotes the pore size of the resin in Angstroms. The letters Tm or Ts refer to an endcapped column (minimal free silanol groups). The endcapping in Ts is more exhaustive than that found in the Tm products. Tosoh Bioscience also supplies octyl (C8), phenyl, cyano (CN) and trimethylsilane (C1) columns for RPLC. Example: TSKgel ODS-80Tm = C18 on silica with 80 angstrom pores, endcapped. 3. How do I select the optimal RP column for my application? 4. Do you have a Guide to Column Selection? 5. What are “Super Series” RPC Columns? Super Series RPC columns are monodispersed spherical silica particles with 2mm particle diameter and 100 Angstrom pores. They are available with ODS, Octyl and Phenyl ligands and cover a full range of polarities (hydrophobicities). An exhaustive endcapping process assures minimal silanol activity. The small particle size resin used results in very high separation efficiency, good resolution and increased speed of analysis. 6. 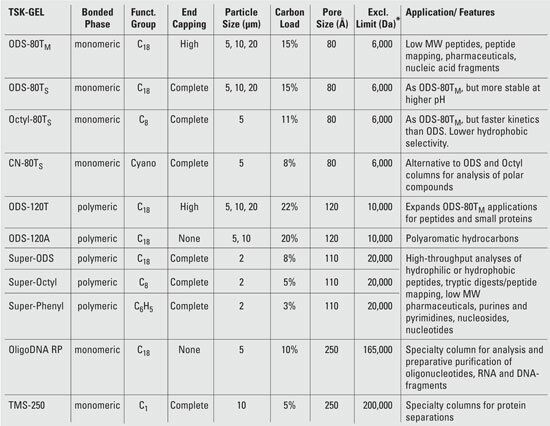 Does Tosoh Bioscience also offer polymeric based RPC columns? 7. What are chemical and physical properties of TSKgel Reversed Phase LC columns?